Lessons FAQs | Swing Des Moines! Wear something comfortable. I recommend yoga-type pants for the ladies, or a comfortable casual skirt, and khaki pants or jeans for the gentlemen, paired with comfortable, non-grip shoes. You might also try wearing tennis shoes (like Keds) with tape over the bottom to make them less grippy. Well, too bad for you! No, really, if you need to miss a class, you may come a few minutes early to the next class and we’ll see if we can get you caught up. Please let us know if you want to do this so we’re certain to be there early for you. Please know, however, that the 5-10 minutes we spend catching you up will not replace the full hour of class that you missed – it’s usually enough to give you a gist of what we learned, but not enough to help you perfect it. Classes taught through West Des Moines LearnWest are not refundable. Private Lessons and Group lessons booked through Swing Des Moines are refundable only before the first class of a session. Once a session has started, we consider refunds on a case-by-case basis. For circumstances under which we are unable to offer you a refund, we may be able to offer you a voucher good for future classes. Can I join a class that’s currently in session? No. While we occasionally allow students to join a session after the first class, we do not allow students to join after that. First, do not risk your personal safety to come to class. If there is bad weather and you suspect class might be cancelled, you can check the website or give us a call. West Des Moines LearnWest classes are automatically canceled when West Des Moines’ school system closes for inclement weather. We also will call the phone number we collected during your registration if we cancel class. We will do our best to reschedule cancelled classes, but cannot promise they will be rescheduled. Partners are needed for West Des Moines LearnWest classes. Partners are not required for group and private lessons offered separately by Swing Des Moines. 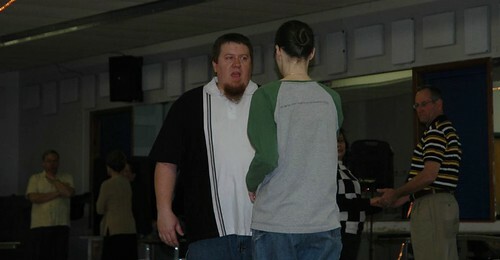 Partners are not needed for the basic lesson offered at the beginning of monthly Jive Junction dances.